Slice the pepper and fry with the pancetta for a few minutes. Put these in the middle of your lamb with the leaves from a few sprigs of rosemary. You may not need all of the pepper and pancetta, any leftover can go into the roasting tray with the lamb. 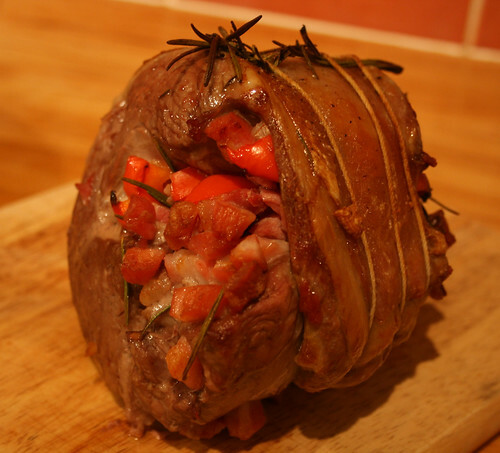 Now roll the lamb up and secure with butchers string. Put the lamb into a roasting tray, season and drizzle over some olive oil. Roast at 200c for 15 minutes per 500g plus 15 minutes. 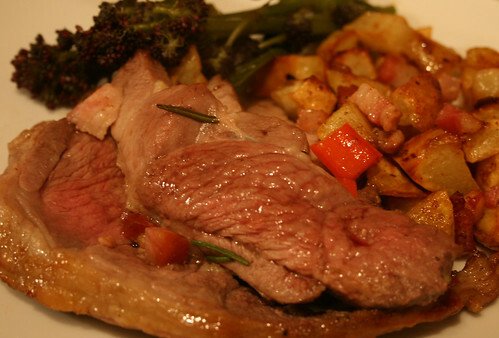 I served this with steamed purple sprouting broccoli and cubed roast potatoes, cooked in with the lamb.